The New Green deal is what needs to be done if you believe the science. But nobody really believes the science. Its all just a game with politicians paying lip service. Cortez actually might believe the nonsense. It's real Alice in Wonderland fantasy stuff. They think they can reduce carbon emissions with renewable energy. They think all the ******** is true, and that renewable energy is cheaper and will create high paying jobs due to the transition. The Democrats have been pushing this mantra so long it looks like one of them actually believes it. They cant tell Cortez she's a lunatic because this is what the Democrats have been saying for years. And they have a mountain of fake science that proves it now. They're so deep down the rabbit hole they don't know what reality is anymore. But they'll find out. The TRUTH is a *****. Last edited by MrCombust; 07-02-2019 at 09:08 PM. "Re-regulating the domestic financial system to ensure that the creation of money at low rates of interest is consistent with democratic aims........."
"Breaking up the discredited financial institutions............."
"Re-regulating and restricting the international finance sector................"
"Giving poorer countries the opportunity to escape poverty without fuelling global warming by helping to finance massive investment in climate-change adaptation and renewable energy..................."
"environmentalists have tended to neglect the role of the finance sector and economic policy; how those involved in industry, broadly defined, have failed to grasp the malign effects of the finance sector on the overall economy; and how trade unionists have for too long ignored financial and environmental concerns." "When it comes to propaganda, which was used so effectively in the run up to World War II, two approaches will be needed.............."
"banking establishments are more dangerous than standing armies,"
"The Green New Deal entails re-regulating finance and taxation plus a transformational policy programme aimed at tackling the unemployment and decline in demand inevitable in the wake of the credit crunch............."
"Our initial proposals for financial renewal involve Very much tighter controls on lending and on the generation of credit." "Roosevelt’s was a huge infrastructure programme aimed at employing four million workers. It paid for over 600,000 miles of roads, over 120,000 bridges, nearly 40,000 schools, 8,000 swimming pools and over two million public toilets. It also had a ‘green’ aspect." "The potential for mobilising global pension-fund money There is a further possible route for spreading the Green New Deal beyond the UK. This lies in the potential for mobilising the capital entrusted to the world’s pension funds to finance the investment required for environmental transformation." "At the heart of a successful programme to tackle climate change will be everrising fuel costs per unit of economic activity. A serious recession will cut energy demand and might result in a price drop, but we believe the imminence of peak oil, coupled with the need to make fossil fuels ever dearer to enforce climate-change agreements, will ensure rising costs per unit of economic output." Last edited by MrCombust; 08-02-2019 at 06:21 PM. Climate advocates scream "SCIENCE", then call you names (republican), and show you a cartoon. It's a good tactic when the actual science is crap. Does it look like sea level rise is accelerating in St. John's NFLD? And this could be expected. Capitalists also line up to take advantage of any crisis or spending boom. Similarly many people push for massive government spending and assistance on many other issues with the agenda of aiding the private sector and capitalism. Post WWII rebuilding and veterans housing, nuclear research, medical research, NASA’s moon mission, and the list can go on and on. Just 20 years ago there was the bailout of banks, borrowers, consumers, manufacturers during the fiscal crisis. Had anyone put all this subsidization and assistance in some kind of crazy manifest it too would be shocking in its Nazism or dictatorialism. Giving hundreds of billions totalling into the trillions globally to banks, car manufacturers, etc. to ensure their survival from their own mistakes. One good local example has been the calls for the Heritage Savings Trust Fund to be “invested” here in Alberta in local businesses. Others have called on it to be “invested” to create local jobs. Last edited by KC; 09-02-2019 at 05:02 PM. So below the graph shows temperature but there will also be changes to frequencies and precipitation, wind, etc and day counts. So in terms of day counts think of the “dirty thirties”. Just another drought but many plants and crops can withstand a short period of stress. Double that of increased the frequency and you quickly get into the realm of disaster scenarios for plants that have evolved or survived for a different type of climate volatility. For a couple decades I’ve been bringing up the simple old normal curve. Understanding the normal curve you likely studied in junior high or high school can go a long way to understanding the effects and risks of rising temperatures and other climate related variables. Causes are another matter. **** poor graph but you’ll get the point - maybe. My first thought is to apply this graph to Edmonton.........., I mean, why not? We're in Edmonton. Now Edmonton, being one of the coldest cities on the planet, must be to the far, far left on this graph. Long winters, freezing springs, early falls, and a general longing that summers in Edmonton will happen on a weekend so we're not at work when it happens. Instead of -40 degree nights in the winter, it's only -37. Maybe the car will start. Instead of subzero spring, maybe the ice will melt in March. Instead of a snowstorm, maybe on Hallowe'en it'll just rain. And summer? A longer crop season? More days at the beach? Maybe summer will last a full week? You see, this is the odd thing about climate change "science".Everything that changes, is bad. Ever seen a "climate change" article, journal publication, movie, news report, about something good happening? Won't any creature on the earth benefit from "climate change"? Shift that graph, baby, shift it. Edmontonians often shift the graph by vacationing in Mexico. Does KC know there's even direct flights? When was the last time you saw a Jamaican vacationing in Edmonton for the winter? That's a shift to the left. Not so popular. Last edited by KC; 09-02-2019 at 05:20 PM. Im just bumping forward a couple earlier posts. 3) Whether the shift is more, or less harmful overall. Every single one of my posts addresses at least one of these three points. Which are great points to address. However, if findings haven’t been established without doubts on points #1 and #2, then wouldn’t you consider point #3 as very important? So, in your assessment would a shift be ”more, or less harmful overall”? On the issue of “normal variability”, the normal curve is the result but such normal variability is data dependent so normal is a bit of a misnomer. Change the data and the curve will change. Then to just stare at the middle of the graph without regard to the rest of it is to often ignore the most relevant aspect of it. “	I ask myself, ‘Why is it that several dozen people saw this crisis coming for years?’ I described it as being like watching a train wreck in very slow motion. It seemed so inevitable and so merciless, and yet the bosses of Merrill Lynch and Citi and even U.S. Treasury Secretary Hank Paulson and Fed Chairman Ben Bernanke — none of them seemed to see it coming. So it’s more or less guaranteed that every time we get an outlying, obscure event that has never happened before in history, they are always going to miss it. And the three or four-dozen-odd characters screaming about it are always going to be ignored. . . . So we kept putting organization people — people who can influence and persuade and cajole — into top jobs that once-in-a-blue-moon take great creativity and historical insight. But they don’t have those skills. Please explain your theory of right- and left-brained CEOs, and how we keep choosing the wrong ones at the wrong times to lead American firms. I think what I call the Great American Executive is always going to be good at dealing with crises after they’ve occurred. Always moving fast, focused, short-term-oriented at making decisions. Usually they’re short-term-oriented decisions. And he has a lot going for him or her. The weakness is that special outlier events are never, ever seen coming. They’re just not the kind of people that think along those lines. That’s a more creative, right-brained activity. What I refer to as “the feet on the table with a coffee cup,” bullshitting about the 1930s and 1970s–[that type of person] could happen. And you take outlier events very seriously. They are informed by history and know that strange things shock the world at regular intervals. And your impatient, decisive short-term CEO is not tuned in to get that. Nor is he tuned in to listen to anyone in the organization saying they should watch their tails. Also, CEOs are very aware of career risk. If they’re too conservative, they are likely to be replaced by a more gun-slinging type from Credit Suisse, as I like to say. Do the boards share same characteristics of the CEOs? Yes, and it’s a shame. They are made up of CEO buddies and bootlickers. In theory, it’s an opportunity to put in more philosophical, right-brained input in a way that the CEO would have to listen–not in the way he can dismiss his in-house think-tank types. You can have members of the board lean on him, and he might listen, or she might listen. But by having similar CEO types and friends dominate, you’re not going to get that help. It’s a missed opportunity. I think I’m right-brained, incapable of managing my way out of a brown paper bag. "My second theory would be even harder to prove, and this is it: that CEOs are picked for their left-brain skills – focus, hard work, decisiveness, persuasiveness, political skills, and, if you are lucky, analytical skills and charisma. The “Great American Executives” are not picked for patience. Indeed, if they could even spell the word they would be fired. They are not paid to put their feet up or waste time thinking about history and the long-term future; they are paid to be decisive and to act now. The type of people who saw these problems unfolding, on the other hand, had much less career risk or none at all. We know literally dozens of these people. In fact, almost all the people who have good historical data and are thoughtful were giving us good advice, often for years before the troubles arrived. They all have the patience of Job. They are also all right-brained: more intuitive, more given to developing odd theories, wallowing in historical data, and taking their time. They are almost universally interested – even obsessed – with outlier events, and unique, new, and different combinations of factors. These ruminations take up a good chunk of their time. Do such thoughts take more than a few seconds of time for the great CEOs who, to the man, missed everything that was new and different? Unfortunately for all of us, it was the new and different this time that just happened to be vital. It is therefore ironic that we fire these top CEOs when the trouble hits. The headline should read: “Come back, leaders of Merrill, Citi, Bear, and Lehman. All is forgiven (for a while).” The typical CEO is precisely equipped to deal with emergencies and digging out. Thus, Paulson was just the man to miss the point, but equally just the man – or at least a typically good one – to deal with a complicated crisis under stress." Last edited by KC; 10-02-2019 at 10:16 AM. 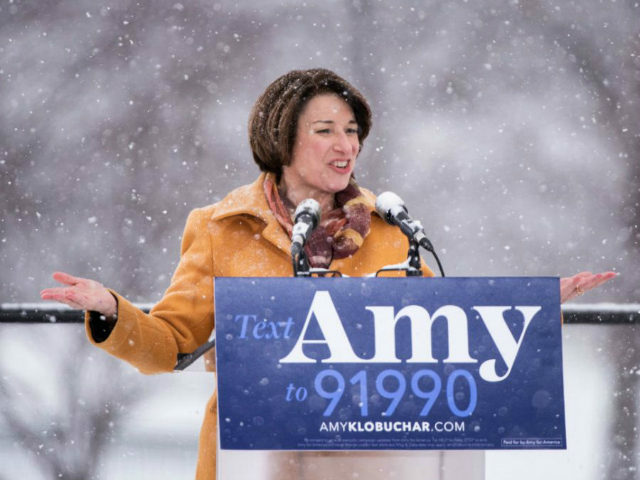 Amy Klobuchar anounced her bid to run for presidency, and promised to fight climate change............ during a blizzard. ^Confusing climate with weather again, are we? I've posted many times how they keep fudging the data to match the predictions. Here's a new paper fudging ocean temperatures to match the average of 33 climate models. SCIENCE! Never mind there are state of the art buoys all over the oceans accurately measuring the ocean temperature. It doesn't matter how accurate the thermometers are, the data always needs to be "adjusted". And always adjusted upwards. The red bar is the new "observation". The black bar is the average of 33 wrong climate models. "90% confidence"! Confidence in what? Making the data match the predictions? What a hoot! Yes Ladies and Gentlemen of Alberta and Edmonton, we're all gonna die, we desperately need to do something about the warming oceans, but you can't actually read the paper unless you pay. The paper is behind a paywall, as are most climate change papers soooooo important to our survival. From the paper "How fast are the oceans warming?" Last edited by MrCombust; 13-02-2019 at 07:11 PM. ^The main takeaway from the chart above is how closely the observed change in ocean heat content is tracking the average of the 33 models. Other than a couple of outliers, the models seem to be predicting the change in ocean heat content reasonably well. None of the documents you posted supports your accusation that the data was fudged or changed to match the prediction. Not even Roy Spencer makes this claim in the blog post to which you provided a link. "I have also included Cheng’s reanalysis of ocean heat content (OHC) data over the same period of time, showing how well it fits the *average* of all 33 models included in the study. Cheng’s OHC dataset is now the warmest of all reanalyzed OHC datasets, which means (mark my words) it will gain the greatest favor in the next IPCC report." "What is disconcerting is the huge (8x) range in ocean warming between models for the period 1971-2010." "........That is, how good the various observational and model estimates of ocean warming are.........."
Last edited by MrCombust; 13-02-2019 at 12:34 PM. ^Suit yourself if you no longer wish to respond to my posts. You don't most of the time anyway. Instead you go off on some new unrelated tangent. But this doesn't make your accusation that data was fudged or changed to match the prediction any less wrong. In using the sub-heading "Dodgy Statistics" Spencer was not claiming that Ocean Heat Content data was falsified, only not very reliable. Compared to other indicators of global warming (global surface temperature record, sea ice extent and volume, glacier retreat, sea level rise), there is more uncertainty around the measurement of Ocean Heat Content given the vastness and depths of the oceans and the acknowledged shortcomings of past and current observational tools. Despite Spencer's skepticism, this is an argument to keep improving the science and the measurement tools. he's stop posting to a lot of people. Anyone who disagrees with him in a reasonable fashion, but not before he's selectively narrowed in on one small minute data point. Also doesn't seem to understand the difference between weather and climate. "Here's the latest data fudge to match predictions......."
Australia just fudged it's temperature data upwards..........AGAIN. 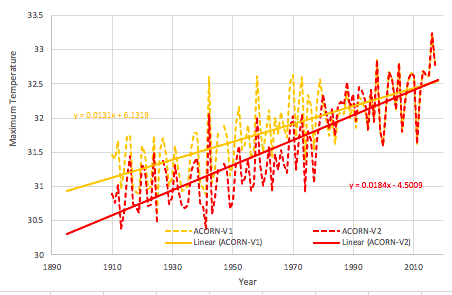 Australia's bureau of meteorology, like NASA and NOAA, have been fudging their temperature record upwards for decades. They do it to individual stations, and on the overall temperature record. "The BoM hasn’t yet issued a press release to announce ACORN 2 and there’s been no media coverage. " No media coverage? What a surprise that is. Look for NASA and NOAA to fudge their worldwide temperature record upwards again, after all, Australia is part of that dataset. These temperature records DO NOT have actual thermometer readings to back them up. And the press release from the lying media will again be.......... "2019 hottest year on record". This is the fake data they use to implement a federal carbon tax on everybody in our country. You can read more here, but this has been going on for decades. Soon climate science will implode on the lies they're telling. And here's a graph of a previous fudge to make the data fit the predictions, yes, the fudge before this latest fudge.......we don't have a graph of the new fudge yet. Last edited by MrCombust; 14-02-2019 at 10:14 PM. the only person on fudge is you but that's been well established here. Why not answer some of the points raised above? Instead, ignore and pretend like no one but you posts. This thread should be shut down. You don't like what I say so you spam bomb the thread and want it removed. That's not science. But it is "climate science". I've addressed everthing you posted anyway. You dont read my posts. They moved stations, changed equipment, changed the time of measurement etc because they never envisioned someone coming along and using the data for minute temperature change analysis of long term site and time specific trends. Nearly every single station in the network in the network has been moved at least once over the last century, with many having 3 or more distinct moves. Most of the stations have changed from using liquid in glass thermometers (LiG) inStevenson screens to electronic Minimum Maximum Temperature Systems(MMTS) or Automated Surface Observing Systems (ASOS). Observation times have shifted from afternoon to morning at most stations since 1960, as part of an effort by the National Weather Service to improve precipitation measurements. All of these changes introduce (non-random) systemic biases into the network. For example, MMTS sensors tend to read maximum daily temperatures about 0.5 C colder than LiG thermometers at the same location. There is a very obvious cooling bias in the record associated with the conversion of most co-op stations from LiG to MMTS in the 1980s, and even folks deeply skeptical of the temperature network like Anthony Watts and his coauthors add an explicit correction for this in their paper. So if the adjustments are subject to criticism are there any long standing methodologically unchanged temperature records in existence and what do those measurements show? Last edited by KC; 15-02-2019 at 08:28 AM. These are lies. Climate lies. Why do you have to fudge temperature data upwards because you moved a station? It's laughable nonsense. Ànd how many times do you get to fudge the data? It's been 3 decades of ever higher fudging. And they're still going. Where's the explanation for Australia's latest fuďge? In science when you draw a graph you use the readings you got when you took the measurement. If you think it's not accurate you throw out the data or add error bars. What you DON'T do is change the graph, and represent it as original data. Skepticalscience is a liar blog and these are climate lies any fool can see through. Except the devoted. Religious climate devotees believe anything they're told. Last edited by MrCombust; 15-02-2019 at 09:12 AM. Why do you have to fudge temperature data upwards because you moved a station? It's laughable nonsense. So what about a heat island effect? I guess the temperature record should not be adjusted down for the laying of miles of black asphalt and the heat output of thousands of vehicles, factories, buildings and people. That data tells it like it is so they should use it as is: pure and untouched, right? Also, in science data has always been altered. Outliers are often dropped. Errors due to human error, such as interpreting what had to be a 7 as a 1 are dropped. Simply put, data is cleaned. Additionally periodic data sets are often presented despite having far more detailed data. Month end data may be used and thus making invisible more extreme data points. Last edited by KC; 15-02-2019 at 08:54 AM. The land based records provide very good idea of past temperatures. If treated with scientific integrity you would have a good idea of the past, even with the problems. The real problem is with the fraudulent data manipulation methods used by the current culture of climate science. "It would be good to remove at least part of the 1940s blip, but we are still left with “why the blip”." "absence of clear climate change in the United States"
But the raw data should ALWAYS be published, with error bars. That's science. Even perfect data is useless if scientists change it, and/or lie about it. Tell me why Australia is fudging the temperature upwards again......., where's the scientific report to thoroughly explain the "adjustment"? Why are arctic stations hundreds of miles from other stations fudged upwards? They weren't moved, no equipment was changed. Why does NOAA record record high temperatures in places they don't even have weather stations? The solution is easy. Start criminally charging scientists who publish fraudulent papers. There are thousands of them now. Clear fraud. The whole thing would be cleaned up in a year. Want to know why the data is fudged to show warming due to CO2? They wouldn't have a job if they didn't. WHO fudged this data? Why? No explanation? You're fired. Last edited by MrCombust; 15-02-2019 at 12:37 PM. There are thousands of stations all over the world. Show me one (1) that changed from a rural area to a cityscape and then the data was fudged lower to compensate. Last edited by MrCombust; 15-02-2019 at 01:27 PM. 1900 to 1920 are raised. Why would they raise early, cold, temperatures if they wanted to show more global warming? 1920 to 1950 is lowered. 1950 to 1990 is raised, smoothed, and flattened. 2000 to 2010 is raised. What do you get? A fake hockey stick graph. Natural variability before 1990 is flattened, warming after 1990 is exaggerated. Look at the raw data. What caused 1.5 degrees of warming 1900 to 1950? 1940 to 1980 is a 40 year cooling trend. That's no good if you want to show CO2 is controlling the temperature. Does it look like rising CO2 is correlated? Look at the red (adjusted) data, doesn't that look better? Last edited by MrCombust; 15-02-2019 at 01:24 PM. Take a look at this chart, which has been doing the rounds of Climate Change denier blogs and other discussion forums under the title of 'NASA satellites reveal no Global Warming for 30 years'. The original source appears to be here, a blog called C3 Headlines. Pretty conclusive heh? Four out of six data points showing cooling easily balancing out the two that show warming. The source of the data, the very respectable National Space Science and Technology Centre, adds a touch of respectability too. Well, the data isn't made up. The original numbers are all here and, although it takes a bit of time to wade through them, the figures used on the chart are correct. What's been done is a bit of good old fashioned cherry picking. That's easy enough to do, but what some eagle eyed denier has spotted is that the cherries that are worth picking lie at 5 year intervals. Neat. The result is a bit like the Bible Code. If you have a big enough set of numbers then, rather like the million monkies with their typewriters coming up with Hamlet, there's always going to be a pattern that shows what you want to find. If you searched hard enough you'd probably find the results of the Six Nations rugby tournament hidden somewhere. This trick wouldn't have worked last month, where the figures would have been 0.19, -0.04, -0.18, 0.03, -0.13 and 0.02 - a clear warming trend, even though this has been a cold winter. The trick certainly didn't work last February either, when the data set would have shown an even stronger warming trend: 0.18, -0.09, -0.01, -0.24, -0.32, -0.07. Games like this can be played all day, but they don't really prove anything. The only way to tell if we're warming or cooling is to do a proper statistical analysis, and that's shown on the bottom line of the data - a warming trend of 0.14 degrees per decade. At 15 years this trend becomes statistically significant with a confidence level of 95%. So, we are warming. But I'm not going to leave it there. If any climate scientist had tried to use a trick liked this to 'prove' Climate Change, then it would have been all over for the discipline. C3 Headlines can get away with this stuff because it serves a particularly gullible and self interested client group. Scientists by contrast have to be open, honest and upfront. When Professor Phil Jones and the UAE were accused of fraud after Climategate their entire body of work was on trial. The likes of C3 Headlines though are expendable. They put out their bogus data, which can ultimately be denied itself by those who fund it and quote from it. As Jay Inslee, a Washington Democrat, lamented on Tuesday, if only the media would stop reporting the debate about Climate Change as if it was a divorce trial and start showing how barren the cupboard was on the denier side. Spam bombing the forum again? At least use quotes and provide a link when you cut and paste your spam bombs. Descriptive subject lines and research into your posts are encouraged. These simple procedures reduce the chance of duplicate posts and ensure that other members can read items that they find important and ignore the rest. When posting newspaper articles, only post the first 150 words followed by a link to the article's source. When posting images be considerate of people who have slower computers and connections that you. Try and keep large gallerys off site or else at least warn in the thread title if there are many images. Maybe you could heed your own advice copypasta warrior? I really enjoyed reading post #1328!!! Moreover I wouldn’t see it as spam in the slightest. Identifying cherry picked data or patterns in data is highly relevant to understanding the credibility of the people presenting a position. Additionally, simply understanding the issues at play and reasoning behind any data selection is important. Blindly saying that the raw data has been fudged and so is invalid just shows inherent bias and not a pursuit of the truth. So in the case of a station not moving and not changing equipment but adjusting the data, that may be a valid methodology if the timing of the data collection was changed. Last edited by KC; 15-02-2019 at 03:50 PM. That’s a great request!!!! I can’t do anything about it. However I find it hard to believe that such an obvious failure to adjust for a heat island effect wouldn’t have been sought out by now by the many sceptics out there. Surely they must have published the results of their findings somewhere. As usual, the climate advocates scream "SCIENCE", but completely ignore it. medwards' posts crap from a liar blog and he thinks it's "SCIENCE". It's not. This is a graph of RSS satellite temperature data vs climate model predictions. RSS and UAH use the same satellite data and are very closely related. I'm not going to go through the half-wit nonsense medwards' liar blog babbles about, but you can see how carefully they avoid comparing the UAH satellite data to predicted warming. 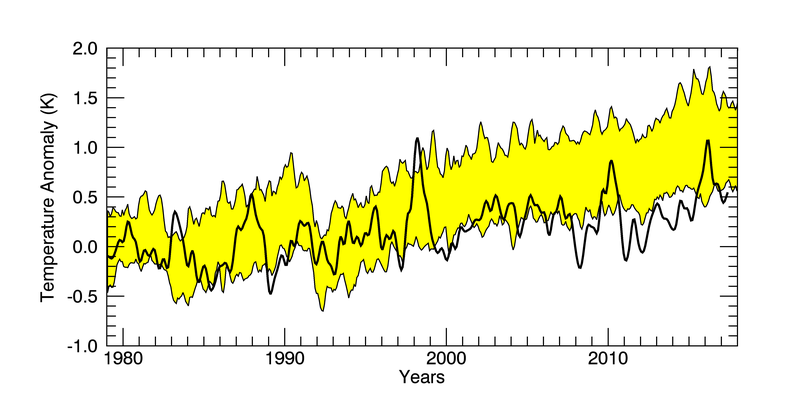 RSS satellite data is the black line BELOW THE YELLOW ERROR MARGIN of climate model predictions. Medwards' liar blog says there's a "confidence level of 95%" that there's a warming trend. Well I'm 100% confident there's a warming trend. I'm also 100% confident the warming trend is below all predictions, the climate models are not accurate, and can't be trusted. The long flat trend in the RSS data is what's known as the pause. Warming is not rising exponentially as predicted. Everybody knows it, because the science proves it. "No statistical global warming" means the warming trend is so low it actually disproves the climate models. Not only is the warming trend low, the trend itself is declining. The liar blog says "The only way to tell if we're warming or cooling is to do a proper statistical analysis, and that's shown on the bottom line of the data - a warming trend of 0.14 degrees per decade." But that was when this blog was posted in 2011, 8 years later updated UAH data now shows a warming trend of 0.13 degrees per decade. So rather than an increasing rate of warming as CO2 is being added to the atmosphere, a declining rate of warming is in progress. Ladies and Gentlemen of Edmonton and Alberta........, keep the link below handy. When someone tells you climate change is real, we're all gonna die, and we need a carbon tax to save the planet................ show them this graph of the climate models getting it wrong and ask them if they're basing their concerns on climate models that can't predict 10 years ahead, never mind 100. Last edited by MrCombust; 17-02-2019 at 12:00 PM. That's what the world needs. Another billionaire flying around on a private jet telling everybody else to take the bus. Lowest temperatures ever recorded smashed all over the United States. Snow in Las Vegas, and Malibu. Nasa's hockey stick, exponential, 100 years of rising temperatures is a farce. And the Vikings still haven't returned to Greenland. "A federal judge in Pennsylvania dismissed a climate lawsuit brought by an environmental organization and two children against the federal government. The lawsuit, Clean Air Council v. United States, claimed that Trump administration rollbacks of environmental regulations and other “anti-science” decisions violate Constitutional rights and the public trust. " The TRUTH. Nils-Axel Morner has a message for NASA and the IPCC..."the pink field of nonsense.". Nils-Axel Morner has been studying sea level rise for a long time. He thinks sea level rise is about 1mm/yr. NASA throws up a satellite and tells everybody it's 3.4mm/yr and accelerating, throwing Mr. Morner's life's work under the bus. Mr. Morner has a message for the people meeting at the Cop24 climate summit..... "sea level rise is a modest 1.1mm/yr", "those who say it's more are simply wrong and it's against science", "idiots are writing papers". So this debate has been going on for something like 4 decades now. What are the readings from the anti-global warming people’s weather stations showing? By now they should have hundreds or thousands of stations around the world and have continuous data records going back to at least the 1980s. Recording hourly temperatures, water levels and whatever else isn’t exactly an “establishment” monopoly. If the establishment is fudging data, what are all the critics measurements showing? Where is all their indisputable data? We use the same data. We just don't lie about it. And we don't change it. 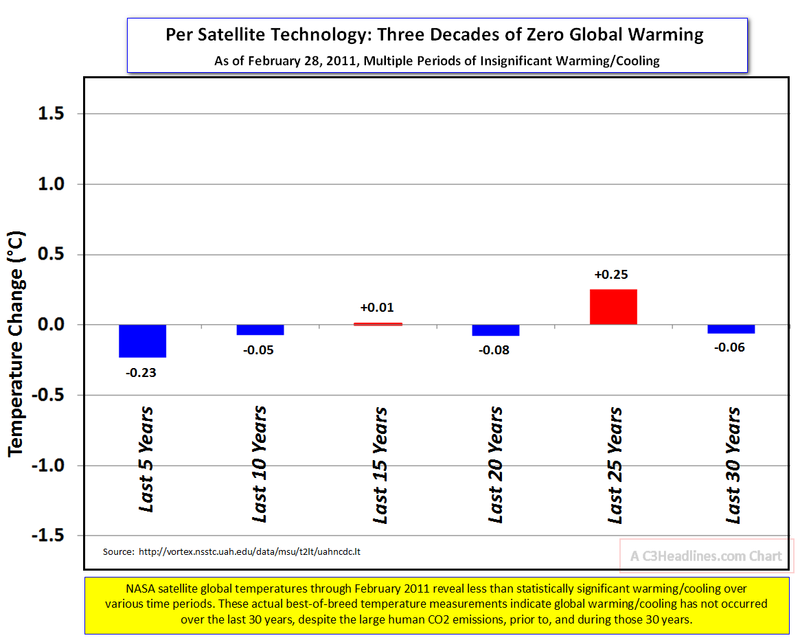 NASA's data shows no global warming if you don't fudge the actual temperature readings. Tide guages show the oceans aren't rising. Satellite data shows long term warming substantially smaller than natural variation, so the long term trend could simply be part of the natural variation. Ice core records show the last 10,000 years warmer than today. Record high snowfall in Arizona. The climate idiots say that's because of global warming. You might as well **** on me and tell me it's raining. If you compare the climate models to satellite data you can see they have all failed. That's what the known, actual data shows. Relying on them to predict future warming is stupid. Skeptics don't need thier own data. The known data doesn't indicate CO2 is affecting anything. The climate liars point to a hurricane, or a forest fire, or atemperature reading, and pretend it's never happened before. Well, it has, and if you stop lying about it, there is nothing unusual about the current weather, or temperature. Nils-Axel Morner is right. Idiots and liars ARE writing papers. The journals and media are awash with stupid science.All we need is to do is start criminally charging the worst offenders with fraud. Look at the tide gauge below. Does it look like sea level rise is 3mm/yr and accelerating? What a joke. And yes, there are hundreds of tide gauges, I provided the link to them. Last edited by MrCombust; 23-02-2019 at 03:26 AM. That makes no sense whatsoever. There absolutely must be some weather stations etc set up by the anti-global-warming activists. It would be totally irrational and illogical to find fault with establishment data and not just create one’s own data sets in order to show the two side by side. 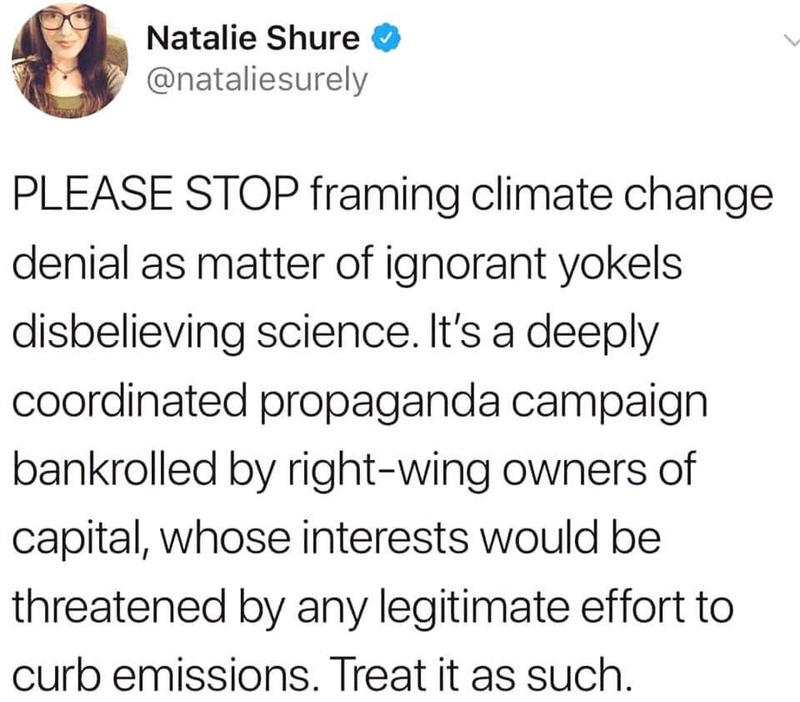 Recording temperatures isn’t exactly a multimillion dollar exercise and even it it was, there’s long been money available from vested interests. So there has to be some data to show that the establishment is gaming the numbers by moving stations and changing equipment, etc. So where is it? I’d expect at least - AT LEAST - 30 years of data being made public by the anti-climate change activists. Last edited by KC; 23-02-2019 at 08:07 AM. Your source is The Heartland Institute???? Do you realize who these people are and what other causes they supported?? The Heartland Institute are against public healthcare, against public schools, and actively promote smoking and the tobacco industry. They get money from vested corporate interests including the coal industry. Heartland has long questioned the links between tobacco smoking, secondhand smoke, and lung cancer and the social costs imposed by smokers. One of Heartland's first campaigns was against tobacco regulation. According to the Los Angeles Times, Heartland's advocacy for the tobacco industry is one of the two things Heartland is most widely known for. During the 1990s, the Institute worked with tobacco company Philip Morris to question the links between smoking, secondhand smoke and health risks. Philip Morris commissioned Heartland to write and distribute reports. Heartland published a policy study which summarized a jointly prepared report by the Association of Private Enterprise Education and Philip Morris. The Institute also undertook a variety of other activities on behalf of the tobacco industry, including meeting with legislators, holding off-the-record briefings, and producing op-eds, radio interviews, and letters. A 1993 internal "Five Year Plan" from Philip Morris to address environmental tobacco smoke regulation called for support for the efforts of the Institute. In 1996, Heartland president and chief executive officer Joe Bast wrote an essay entitled "Joe Camel is Innocent!,"
On Thursday May 3, 2012, Heartland launched an advertising campaign in the Chicago area, and put up digital billboards along the Eisenhower Expressway in Maywood, Illinois, featuring a photo of Ted Kaczynski, the "Unabomber" whose mail bombs killed three people and injured 23 others, asking the question, "I still believe in global warming, do you?" They withdrew the billboards a day later. The Institute planned for the campaign to feature murderer Charles Manson, communist leader Fidel Castro and perhaps Osama bin Laden, asking the same question. The Institute justified the billboards saying "the most prominent advocates of global warming aren't scientists. They are murderers, tyrants, and madmen." MrCombust is in good company. Ya, I'm also using the internet. You forgot to mention all the credibility problems with the internet. Don't worry, you have ZERO credibility. That's exactly what the Berkeley Earth team was put together to do. Create an independent temperature record and clean up what they felt was a bunch of errors etc in the other temperature records. The head of the effort, Richard Muller, was a climate change skeptic prior to the effort. To his credit, he admitted he was wrong previously and that their independent record did not differ in any great degree from the numerous others. Unfortunately other scientists in the effort rejected the final findings and walked away. To their great discredit. I'm prepared to accept whatever result they produce, even if it proves my premise wrong. ... [T]he method isn't the madness that we've seen from NOAA, NCDC, GISS, and CRU, and, there aren't any monetary strings attached to the result that I can tell. ... That lack of strings attached to funding, plus the broad mix of people involved especially those who have previous experience in handling large data sets gives me greater confidence in the result being closer to a bona fide ground truth than anything we've seen yet. When the initial results were released, and found to support the existing consensus, the study was widely decried by deniers. Watts spoke to The New York Times, which wrote: "Mr. Watts ... contended that the study's methodology was flawed because it examined data over a 60-year period instead of the 30-year-one that was the basis for his research and some other peer-reviewed studies. He also noted that the report had not yet been peer-reviewed and cited spelling errors as proof of sloppiness." Steven Mosher, a co-author of a book critical of climate scientists, also disapproved saying that the study still lacked transparency. He said: "I'm not happy until the code is released and released in a language that people can use freely. "(The code and dataset were by then available from the Berkeley Earth Data page.) Stephen McIntyre, editor of Climate Audit, a climato-skeptics blog, said that "the team deserves credit for going back to the primary data and doing the work" and even though he had not had an opportunity to read the papers in detail, he questioned the analyses of urban heating and weather station quality. By contrast, the study was well received by Muller's peers in climate science research. James Hansen, a leading climate scientist and head of NASA Goddard Institute for Space Studies commented that he had not yet read the research papers but was glad Muller was looking at the issue. He said "It should help inform those who have honest scepticism about global warming." Phil Jones the director of the Climatic Research Unit (CRU) at the University of East Anglia, said: "I look forward to reading the finalised paper once it has been reviewed and published. These initial findings are very encouraging and echo our own results and our conclusion that the impact of urban heat islands on the overall global temperature is minimal. "Michael Mann, director of the Earth System Science Center at Pennsylvania State University, commented that "...they get the same result that everyone else has gotten," and "that said, I think it's at least useful to see that even a critic like Muller, when he takes an honest look, finds that climate science is robust." Peter Thorne, from the Cooperative Institute for Climate and Satellites in North Carolina and chair of the International Surface Temperature Initiative, said: "This takes a very distinct approach to the problem and comes up with the same answer, and that builds confidence that pre-existing estimates are in the right ballpark. There is very substantial value in having multiple groups looking at the same problem in different ways." The ice core research scientist Eric Steig wrote at RealClimate.org that it was unsurprising that Berkeley Earth's results matched previous results so well: "Any of various simple statistical analyses of the freely available data ...show... that it was very very unlikely that the results would change". When are you going to understand simple concepts? There is nothing wrong with 'establishment data". Why would you need another data set? Another data set would show the same thing. It's NOT warming. That's what the satellites show. In fact, there's already duplicate datasets. UAH, RSS and radiosonde all measure the same thing. So there's 3 datasets that show the climate models have failed. You want another one? The seas aren't rising. That's what the tide gauges show. You want another set of tide gauges? The only warming to the land based record is when NASA adds warming to the data. Take out the fudging of the data and there's no warming there either. You don't need a duplicate to that record either. Just stop adding warming that isn't there. Use the actual readings from the thermometers. 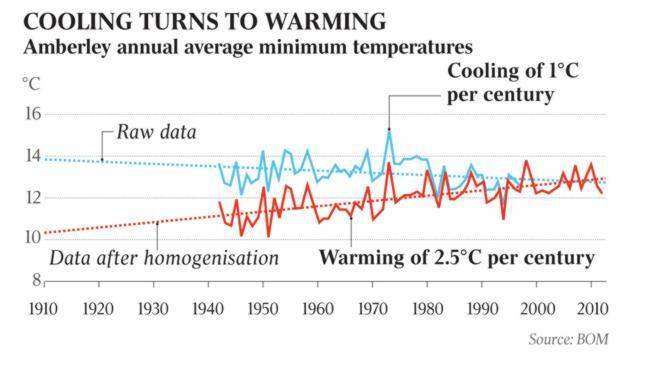 If you're not going to use the actual thermometer readings then add error bars and put disclosures on the graphs you present to the public that you've added warming. Tell people the "record high" temperatures aren't based on actual readings. See how that goes over. Telling the TRUTH is science. Real science. How many data sets do you want? Last edited by MrCombust; 24-02-2019 at 08:47 AM. The TRUTH. Austria says the climate models have failed. I like people who tell the TRUTH. "Future natural air conditioners not consideredIf the share of individual climatic drives in the development of global temperature were misjudged by the climate models, even if they had delivered a realistic result so far, future simulations would be distorted. In addition, other climate drives than the anthropogenic in future scenarios are not considered - they can not be predicted. One problem of the global climate models is the focus of the model quality on the reproduction of the measured global mean temperature. Although this is relatively well simulated, there are concerns as to whether the models' sensitivity to the different climate drives ( solar activity , volcanic aerosols , greenhouse gases , etc.) corresponds to reality. In addition, the drives are not understood properly even with their warming or cooling effect. So it is possible that a climate model correctly simulates the mean global temperature, but due to a wrong sensitivity of the model with respect to its drives"
^^There can never be too many data sets. The greater the number of data sets, the more likely occasional measurement errors will be discovered and corrected. For example, as an amateur weather sleuth, I keep my own temperature data set for Edmonton Blatchford (since 1880) and Edmonton International (since 1960) when record keeping at those sites began. I discovered a minor data entry error for a single year in my spreadsheet for Blatchford when comparing the data with that collected by the Edmonton Weather Nerdery blog. I went back to the original data source, discovered they were right, and corrected mine. Not only NASA but all of the surface temperature data sets including Berkeley Earth (which incorporated data from all available weather stations rather than a representative sample), show remarkably similar degrees of warming. Contrary to your claim above, the UAH satellite measurement data set also shows a warming trend in the lower troposphere. Last edited by East McCauley; 24-02-2019 at 09:25 AM. If NASA fudged thier temperature record higher (which they admit to doing on thier website), then BEST must have done the same thing to get a match. And the owner of BEST is a liar. He pretends he used to be a skeptic but interviews in the media show he was never a skeptic. The satellites show SOME warming. Not very much. As I have pointed out many times, the low rate of warming means all the predictions have failed. What do you do with a theory when hard data disproves your theory? When am I going to understand simple concepts? Well, I may never understand some simple concepts. Interesting article and note the two comments and links at the end. In fact, over the full period when measurements are available, adjustments actually have the net effect of reducing the amount of long-term warming that the world has experienced. Land and ocean temperatures are adjusted separately to correct for changes to measurement methods over time. All the original temperature readings from both land-based weather stations and ocean-going ships and buoys are publically available and can be used to create a “raw” global temperature record. The figure below shows the global surface temperature record created from only raw temperature readings with no adjustments applied (blue line). The red line is the adjusted land and ocean temperature record produced using adjusted data from the US National Oceanic and Atmospheric Administration (NOAA), with the difference between the two in grey. Last edited by KC; 24-02-2019 at 10:44 AM. You don't seem to understand the concept of being trolled, and that's a pretty simple concept. Typical climate advocate foolishness. You talk about "science", then post crap from a liar blog. You think website liar blogs is science. You need to learn what science is. In fact, hard data supports my theory and disproves yours. The UAH satellite data shows a warming trend of +0.13C per decade, or +0.52C in total during the 40 years since satellite measurement began. The NOAA Time Series shows a global warming trend of +0.16C per decade, or +0.64C in total during the 40 years between 1979 and 2018 inclusive. The fact there is a small discrepancy between the two data sets is not surprising. NOAA measure temperatures at the earth's surface where warming is most pronounced. "The satellite-based instruments measure the temperature of the atmosphere from the surface up to an altitude of about eight kilometers above sea level". See page 3 here: https://www.nsstc.uah.edu/climate/20...01901Jan_1.pdf. That's pretty rich coming from the guy who denies all the science behind NASA, NOAA, and the 99% of scientists who agree that climate change is being caused by man-made CO2 emissions. The liar blogs are everything you've posted since day one, and often times, you post it without crediting your source of information. Had this thread officially declared the earth flat yet because I won’t believe anyone’s position until we do. We need to start from a foundation of truth! Last edited by edmonton daily photo; 25-02-2019 at 01:20 PM. ^Feel free to ignore this thread. But so long as MrCombust keeps posting inaccurate information and/or makes misleading or false claims, I reserve the right to set the record straight and post accurate information appropriately sourced. East.... we share a common foe. You are fighting it with facts, me satire. LONG LIVE OUR FLAT EARTH! East doesn't argue with facts. He argues with stuff he makes up. Climate change is based on predictions of warming. Those predictions have failed. East pretends ANY warming validates the predictions. His premise is absurd. Those predictions haven't failed, climate change is happening, and it's main source is human CO2 emissions. That's facts based on real science. Not some liar blog in his mom's basement, or a shill like yourself. What's your source for the claims you make? Liar blogs? I guess you think climate scientists work for free in thier spare time. Look at my post below. Are the scientists working at the Austrian meteorological society right wing paid shills? Last edited by MrCombust; 26-02-2019 at 07:51 AM. It's funny seeing you react to same medicine you dish out. You're the one calling NASA and NOAA and esteemed and well respected climate scientists as "liars". You're the one disagreeing with the consensus of almost the entire scientific community, calling them liars and other cutesy remarks. I pointed to one of your sources is the The Heartland Institute which is a paid lobby group and you ignored it. You are nothing but a troll and probably paid by vested interests. Please send us copies of your tax returns for the past 5 years to prove that you are not a paid lobbyist. My source was not the Heartland Institute. It was Alex-Nils Mourner. I try to argue only from a factual basis. I generally dislike predictions, and prefer to rely upon actual measurements of changes in global temperature, sea ice volume and extent, glacier retreat, and sea level rise. I really wonder if MrCombust is even in Canada... let alone Alberta or Edmonton. Climate advocates are confused by the simplest of concepts. You think ANY trend in warming validates any, and all global warming predictions. 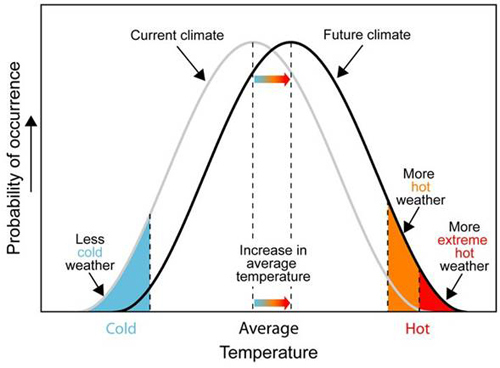 Different climate model scenarios and different climate models predict different rates of warming. You think they're all validated by ANY rate of warming. It doesn't even make sense, but you believe it to be true. This is real Alice in Wonderland thinking. The scientific community knows what the pause is. There are a hundred excuses for it now. For you, there is no pause. Any warming is all warming. You don't seem to even know how silly that is. Last edited by MrCombust; 26-02-2019 at 01:27 PM. And all you do is attack. When I talk about climate thugs, thats what it is. Climate science isn't science, its thugs demanding money for "protection". If you dont pay them money to keep the sea from rising they attack you. And that's what your posts are. Attacking me, and and anybody who doesn't agree to pay. It's thuggery. Plain and simple. Attacking fake news and misinformation is a noble, but thankless job. There's a few of us here that are dedicated the ensuring TRUE facts are offer versus the crap you lay down. You may want to call that an attack. It certainly is an attack on your misinformation. Do you actually live here or have any real interests here outside of pushing your misinformation.? That's a serious question. Don's ask me personal questions. And stop attacking me. I second Medwards's motion. We want to know who is backing you as a shill. You joined this forum and immediately created this thread as a single issue poster. We are all fed up with your lies, misinformation and conspiracy theories. Your tinfoil hat is cooked your brains. Last edited by Edmonton PRT; 26-02-2019 at 02:44 PM. I’m fine with MrCombust continuing to post. However I’m not impressed with the tone of his language and hus continuous accusations he makes against those who deliver information he doesn’t like. Calling these people liars and the like is both judgemental and irrational. Last edited by KC; 26-02-2019 at 07:55 PM. Reason: Made valid adjustments to my wording. I’m with mr combust how can we trust any organization (NASA) that declares the earth as round?! Last edited by edmonton daily photo; 27-02-2019 at 12:58 PM. The TRUTH. NASA scientists embarrassed by the climate change fools. The climate idiots at NASA aren't the same people who got us to the moon. The rocket scientists at NASA wrote a lettter to management asking that they tell the climate fools to shut up as they are giving NASA a bad reputation. We, the undersigned, respectfully request that NASA and the Goddard Institute for Space Studies (GISS) refrain from including unproven remarks in public releases and websites. We believe the claims by NASA and GISS, that man-made carbon dioxide is having a catastrophic impact on global climate change are not substantiated,........"
Last edited by MrCombust; 01-03-2019 at 09:42 AM. a couple former employees of NASA who aren't up to speed on climate change ask NASA to stop? That's kinda awesome. Glad NASA ignored it, and stuck to the proven scientific facts. This is a graph of climate sensitivity predictions. Climate sensitivity is how sensitive the temperature is to increasing CO2. This is a graph of published scientific papers that predict how much the earth will warm. Notice the steady decline in predicted warming. They have no idea how much the earth will warm, and as the earth is NOT warming (the pause continues), they are constantly revising predictions downwards to present a semblance of accuracy. The only accuracy they have is the accuracy of matching predictions with what has already happened. Last edited by MrCombust; 03-03-2019 at 08:53 AM. “Chapter 4 of the "Charney report" compares the predictions of the models: "We conclude that the predictions ... are basically consistent and mutually supporting. The differences in model results are relatively small and may be accounted for by differences in model characteristics and simplifying assumptions." In 1979 Charney chaired an "ad hoc study group on carbon dioxide and climate" for the National Research Council. The resulting 22-page report, "Carbon dioxide and climate: A scientific assessment", is one of the earliest modern scientific assessments about global warming. Its main conclusion can be found on page 2: "We estimate the most probable global warming for a doubling of CO2 to be near 3°C with a probable error of ± 1.5°C." This estimate of climate sensitivity has been essentially unchanged for over three decades, e.g., the IPCC Fourth Assessment Report (2007) says that "equilibrium climate sensitivity is likely to be in the range 2°C to 4.5°C, with a best estimate value of about 3°C. It is very unlikely to be less than 1.5°C. Values substantially higher than 4.5°C cannot be excluded, but agreement with observations is not as good for those values." Last edited by KC; 03-03-2019 at 07:37 AM. Record low temperatures smashed all over North America. Can you imagine the media barrage if it were record high temperatures being smashed? Climate change is a nonsensical fantasy. A parallel universe full of contradictions everybody ignores. Wild camels used to roam Edmonton but "2019 is the hottest year on record". Last edited by MrCombust; 04-03-2019 at 10:13 AM. "On record", unless those camels kept weather records. So very cold..I enjoy reading your posts.. Thanks. We are living in a Dali painting. Up is down. Left is right. And death is life. CO2 and warmth, two fundamentals of all life on earth, are the enemy. A month of -20 degree temperatures, where you will die in minutes without protective clothing, and Edmonton PRT thinks we're soon to be extinct if it gets warmer. They belive it, cuz NASA says so. 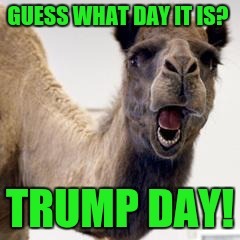 Last edited by MrCombust; 04-03-2019 at 01:03 PM. I was thinking the same thing. 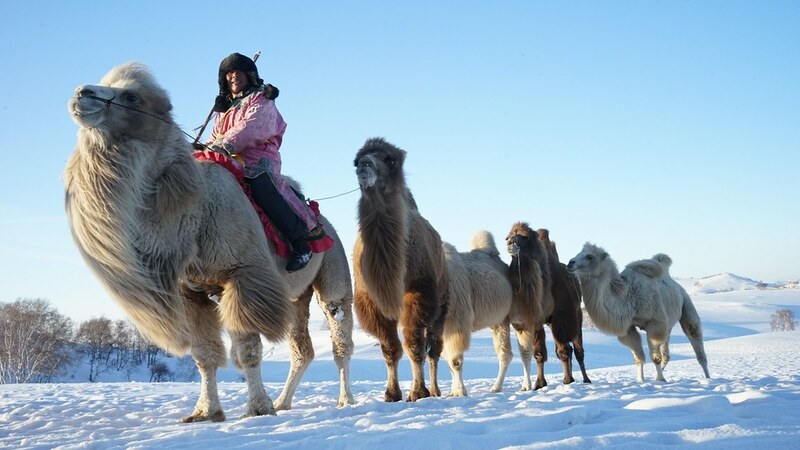 He had to describe them as "wild camels" opposed to "domesticated wooly polar camels"
Note use of winter tires. MrCombust hasn't a clue that camels can live in severe winter conditions. Last edited by Edmonton PRT; 04-03-2019 at 01:00 PM. As requested by Hello Lady. The smashed record lows that I've heard about, and certainly all the ones in Alberta have been like 40-year records, not all time. Those real records are looking pretty safe. The TRUTH. There's NO PAUSE in global warming!!!! Climate change continues unabated!!!! Recent ground and aerial surveys show the mountain pine beetle’s progress through the province’s coniferous woodlands has slowed considerably from last year. The province says extreme cold weather killed off more beetles than usual"
Look back at the temperature lows of the early to mid 1880s. Brutally cold. Temperatures here fluctuate and possibly even cycle. However if you look at the native vegetation in Alberta you don’t find much of a variety of trees or shrubs here as most aren’t considered very cold hardy. Hence should global warming increase temperatures, the province’s trees are very much at risk of being decimated by bugs. Eventually other trees could be planted but the rate of change would be overwhelming. Edmonton Canada bests March 10th record low by -12 degrees, columnist questions climate situation | Watts Up With That? Last edited by KC; 04-03-2019 at 08:20 PM. Yeah, I don't get this myth that our records only go back 40 years or so. More like 140 for western Canada. Maybe not every place but dozens of major centers in Alberta and people who kept records, it was their job and they took it seriously. I recall reading about the record cold temperature in Snag Yukon that happened in 1947. Even at that time, someone took a photo of the thermometer at the airport in Snag and a week later it was sent to Ottawa to confirm the accuracy of the calibration. Last edited by Edmonton PRT; 05-03-2019 at 02:40 PM. Climate change, the cash cow that keeps on giving. Who wants to kill a good thing? "Consultants say 40% of Parks Canada real estate in poor condition"
"An analysis the agency commissioned from an independent consultant says Parks Canada has deferred up to $9.5 billion in badly needed work – and ought to spend up to $3.3 billion on top of that to cope with the threat of climate change." The temperature changes up to 20 degrees each day, 80 degrees variation each year, but 3.3 billion is needed for a 2 degree temperature rise? I'm also confused by this. Should we spend a million gazillion dollars to STOP climate change, as well as a million gazillion dollars to DEAL with climate change? Religion doesn't require logic, just devotion. Last edited by MrCombust; 13-03-2019 at 08:19 AM. Even Mr. "It's all a plot by the Chinese" think's it's something that will affect his bottom line. “I don’t believe it,” Trump says, but his business dealings indicate otherwise. In a permit application for the wall, Trump International Golf Links cited scientific studies indicating that a rise in sea level could result in damaging erosion in a bay near the golf course. As Politico details, Trump’s company even tried to raise awareness about the impacts of climate change in a brochure distributed to people living in the area around the course.